Geneva – IOM, the UN Migration Agency, reports that 88,049 migrants and refugees entered Europe by sea in 2018 through 10 October, with 40,598 to Spain, the leading destination this year. The region’s total arrivals through the recent weekend compare with 142,301 arrivals across the region through the same period last year, and 318,791 at this point in 2016. Spain, with 46 per cent of all arrivals through the current year, continues to receive seaborne migrants in October at a volume approaching three times that of Greece and about eight times that of Italy. 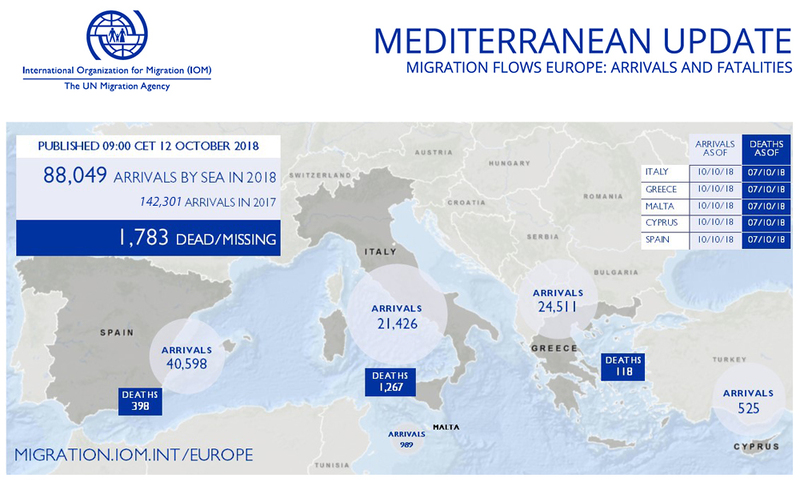 IOM Spain’s Ana Dodevska reported Thursday that total arrivals at sea in 2018 now have reached 40,598 men, women and children who have been rescued in Western Mediterranean waters through 10 October (see charts below). IOM notes that over this year’s first five months, a total of 8,150 men, women and children were rescued in Spanish waters after leaving Africa – an average of 54 per day. In the 132 days since May 31, a total of 32,448 have arrived – or just under 256 migrants per day. Arrivals in October are running at a rate of over 300 per day. IOM Spain’s Oussama El Baroudi notes that with this week’s arrivals Spain has now received via the Mediterranean more irregular migrants than the record number set in 2006 during the so-called “Cayucos crisis” (on a West Africa route) when there was a total of 39,180 sea arrivals, mainly to the Canary Islands. Italy’s arrivals through early October are running at their lowest daily average recorded at this point—just past the busy summer sailing season—in almost five years. Last October migrants were crossing from North Africa to Italy at a rate of nearly 1500 per week—or about five times this year’s rate. Two Octobers ago, the numbers were even higher: almost 4,000 per week. In 2016, through June, July, August, September and October sea-borne arrivals of migrants to Italy the average number of rescues each month surpassed the number that has arrived in all of 2018 (see chart below). IOM Greece reported on Thursday (11 October) that over 72 hours starting from Monday (08 October), the Hellenic Coast Guard (HCG) undertook at least five incidents requiring search and rescue operations off the islands of Kos, Samos and Chios. The HCG rescued a total of 161 migrants and transferred them to those islands. Additional arrivals of some 186 individuals to Lesvos, Samos and Farmakonisi during the same 72-hour period bring to 24,511 the total number of arrivals by sea to Greece through 10 October (see chart below). "From the testimony of the beforementioned person, we learned that they (she and others) sailed on a boat on 8 October 2018 around 20:00; there were about 35 people on the boat, the boat took on water and sank soon after sailing. She said she was carried by the current to the Kuyucak beach. The other people were lost. IOM is also following reports of three female migrants found murdered this week near Greece-Turkey border. IOM Greece’s Christine Nikolaidou reported late Thursday (11 October) authorities continue to investigate the crime, saying the victims—all with their throats slashed and their hands bound—appeared to be between the ages of 15 and 25 and are thought “Asian,” although it remains unclear whether that refers to a Middle Eastern. South Asian or East Asian nationality. A premilinary examination indicated the victims were killed during this past weekend. Police reportedly said a farmer found the victims on the Greek side of the Evros River (also the border between Greece and Turkey), near the town of Didymoteicho. Researchers with IOM’s Displacement Tracking Matrix (DTM) in the Western Balkans reported Thursday some 1,322 irregular migrants were registered in Albania, Montenegro and Bosnia and Herzegovina through the first week of October, six time more than the average of 220 monthly arrivals reported in the countries concerned in 2017 and significantly higher than the weekly average of 36 calculated for the respective countries in October 2017. Between January and October 2018, authorities in these countries registered a total of 23,335 irregular migrants. Researchers say 72 per cent of migrants were registered in Bosnia and Herzegovina, where since the beginning of the year authorities have reported 16,991 new irregular migrants – 15 times more than the 1,116 registered in the whole of 2017 (almost half of the total of 38,444 land and sea arrivals to Europe registered through the Eastern Mediterranean: Bulgaria and Greece). According to the available information on nationalities: the Syrian Arab Republic, Pakistan, the Islamic Republic of Iran, Iraq, Algeria and Afghanistan are the most commonly reported origin countries. Distribution of migrants by nationality varies between the three countries on the route. One third of all registered migrants in Bosnia and Herzegovina were from Pakistan, followed by those from the Islamic Republic of Iran (16%), the Syrian Arab Republic (13%), Afghanistan (10%), and Iraq (9%). In Albania and Montenegro, Syrian nationals comprised the majority (47% and 44% respectively), followed by those who arrived from Pakistan (21% and 12% respectively), Algeria and Iraq (both 8%) in Montenegro and Iraq (8%) and Algeria (4%) in Albania. The differences in the nationality structure of registered migrants between the three countries are explained by the fact that migrants in Bosnia and Herzegovina also enter from Serbia (especially migrants form Islamic Republic of Iran and Pakistan) and that certain groups of migrants from Montenegro continue not only toward Bosnia and Herzegovina but toward Serbia as well. Available DTM flow monitoring data for Serbia and the former Yugoslav Republic of Macedonia also indicate increased movement of irregular migrants to and through these countries. Between January and 10 October 2018, there were 5,837 newly registered migrants in the reception centres across Serbia. This is a 28 per cent increase compared to the 4,554 registered in the same period last year, and slightly more than the 5,435 registered in the whole of 2017. More than half of all registered migrants in Serbia as of 30 September declared Pakistani origin (58%), another 12 per cent were from the Islamic Republic of Iran followed by 9 per cent of migrants from Afghanistan, 6 per cent from Iraq and 6 per cent of Bangladeshi nationals. In the former Yugoslav Republic of Macedonia authorities reported arrival of 2,707 irregular migrants as of 10 October, five times the 546 reported in the whole of 2017. Available information on nationalities as of end of September, indicates that the Islamic Republic of Iran is the most commonly reported origin country declared by 56 per cent of the registered migrants. Afghan nationals comprise another 11 per cent, Pakistani nationals 10 per cent and Iraqi 6 per cent. IOM’s Missing Migrants Project estimates that at least 2,806 people died or went missing on migratory routes across the globe in 2018, through 07 October. (see chart below). The latest deaths in the Eastern Aegean and the Greek Mainland are not included.